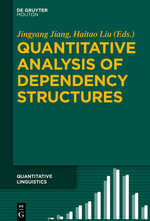 The article presents a quantitative analysis of some syntactic dependency properties in Czech. A dependency frame is introduced as a linguistic unit and its characteristics are investigated. In particular, a ranked frequencies of dependency frames are observed and modelled and a relationship between particular syntactic functions and the number of dependency frames is examined. For the analysis, the Czech Universal Dependency Treebank is used. How Do Universal Dependencies Distinguish Language Groups? The present paper shows how the current Universal Dependency treebanks can be used for language typology studies and can reveal structural syntactic features of languages. Two methods, one existing method and one newly proposed method, based on dependency treebanks as typological measurements, are presented and tested in order to assess both the coherence of the underlying syntactic data and the validity of the methods themselves. The results show that both methods are valid for positioning a language in the typological continuum, although they probably reveal different typological features of languages.